This article is about the 1996 novel. For the 2001 film adaptation, see Bridget Jones's Diary (film). For the musical, see Bridget Jones' Diary (musical). By 2006, the book had sold over two million copies worldwide. Critics have credited Fielding's novel as the "ur-text" of the contemporary chick lit movement. 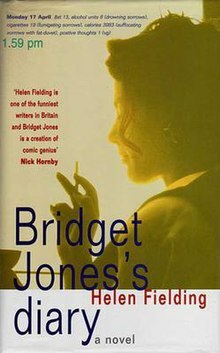 A sequel, Bridget Jones: The Edge of Reason, was published in 1999. The novel won the 1998 British Book of the Year, and Tracie Bennett won the 2000 Audie Award for "Solo Female Narration" for her audiobook narration. In 2003, the novel was listed at number 75 on the BBC's survey The Big Read. A film adaptation of the novel was released in 2001. The film stars Renée Zellweger (in an Academy Award nominated role) as the eponymous heroine, Hugh Grant as Daniel Cleaver, and Colin Firth as Mark Darcy. It was directed by Sharon Maguire (Helen Fielding's friend who was the inspiration for Shazzer) and the screenplay was written by Fielding, Andrew Davies, and Richard Curtis. ^ Kirby, Terry (13 November 2004). "The true story of Bridget Jones". The Independent. Retrieved 4 August 2015. ^ Memmott, Carol (11 June 2006). "Chick lit, for better or for worse, is here to stay". USA Today. Retrieved 11 November 2008. ^ Whelehan, Imelda (2002). Bridget Jones's Diary: A Reader. Bloomsbury Academic. ^ Davidson, Merric. "British Book Awards – previous winners". Archived from the original on 11 March 2007. Retrieved 11 November 2008. ^ "The Audie Awards – 2000". BooksAlley.com. Retrieved 11 November 2008. ^ "BBC – The Big Read". BBC. April 2003. Retrieved 18 October 2012. ^ Shenton, Mark (15 May 2009). "Stage Musical Version of "Bridget Jones's Diary" Is in the Works". Playbill. Archived from the original on 17 October 2012. Retrieved 3 August 2010.